What an epic foodporn scenery in the wilds we have here! The most awesome burger patty made of turkey mince and spice mix, it’s so full of proteins even your personal trainer will definitely recommend that! We didn’t also forget about toppings: Calabrian caviar, fresh tomato, salad and of course crunchy caramelized bacon slices with teriyaki sauce! To keep us comfortable and warm in the wild forest while cooking this marvelous burger we took our new awesome merchandise with us! 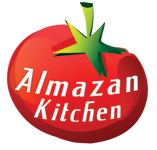 Join to AlmazanKitchen™ Forest Crew by wearing our special cooking hoodies! Slice 300g of turkey breast add 1 tbsp. of paprika and grounded ginger above, chop well until mushy consistency. Form a patty and place slice of raclette cheese inside. Preheat round grill and grease it with oil. Grill turkey patty for 5-10 min. Do not forget to flip! Grill bacon slices and caramelize it using caramelized sugar. Slice somun bread in half. Warm it on the grill. Grease bottom part of bun with Calabrian caviar. Continue to build the burger in the following layers: Bottom bun, handful of salad, patty, fresh tomato rounds, caramelized bacon, and pour with good amount of teriyaki sauce! Cover with top bun.